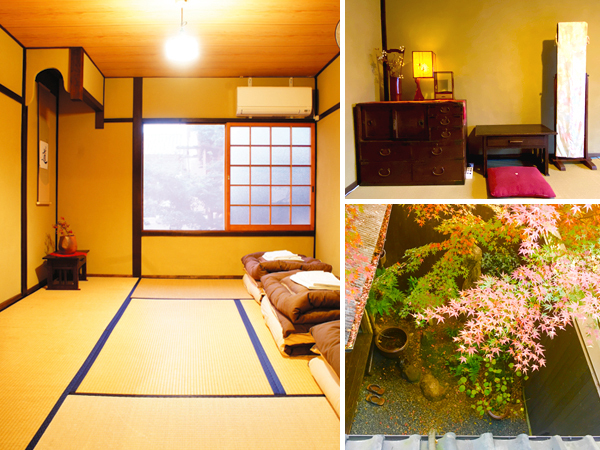 Kyoto guesthouse KIOTO : You can experience the lives of traditional Japanese houses. 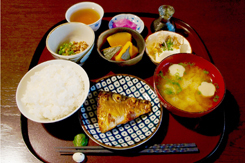 *You can order the Japanese style breakfast price for 700yen / person. From Oct 1st in 2018, in Kyoto "Accommodation TAX" is going to start. It is 200 yen per night per person. Please pay the total bill including "Accommodation TAX" when you check-in. We will guide you to either "KIOTO" or "TONARI" dormitory. Please look forward to which one dorm! 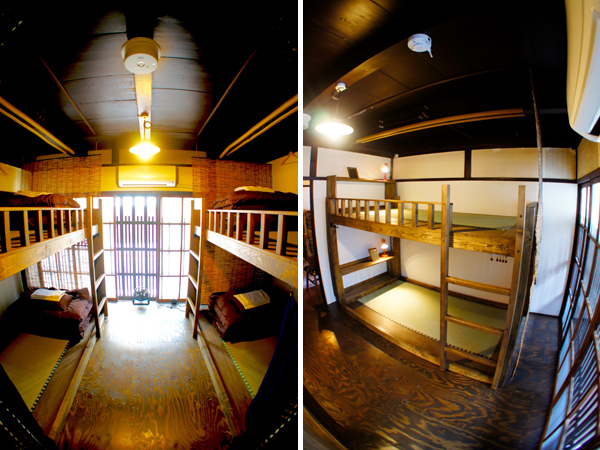 There are dormitory rooms for "KIOTO" and "tonari" one by one. That is used by 4 people. Specially-designed bunk beds include futon, curtains for your privacy, an electrical outlet, reading lamp and mirror. Available for ages 12 and over. It is a shared room used by three people. Include an electrical outlet, reading lamp. Available for ages 12 and over. 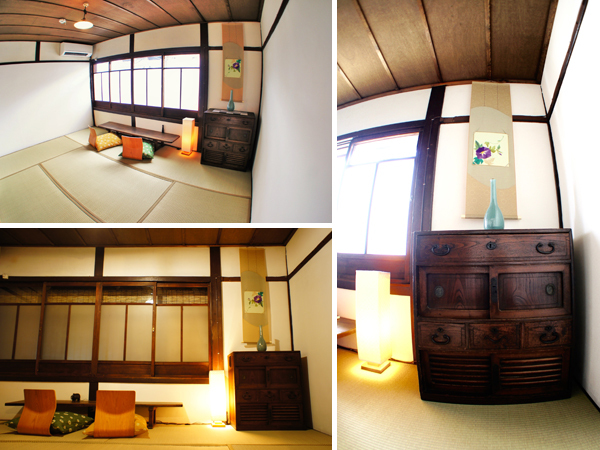 Japanese-style room located on the second floor with a futon bed and tatami mats. Enjoy wonderful views of Japanese maple trees in the Summer, and vibrant colors in the Autumn months. 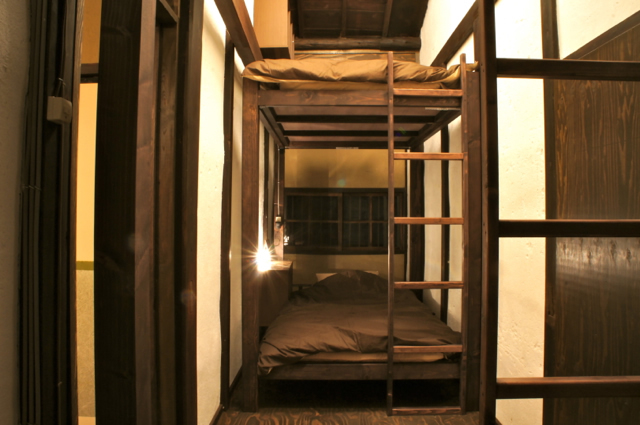 Japanese-style room located on the second floor with a futon bed and Tatami mats. 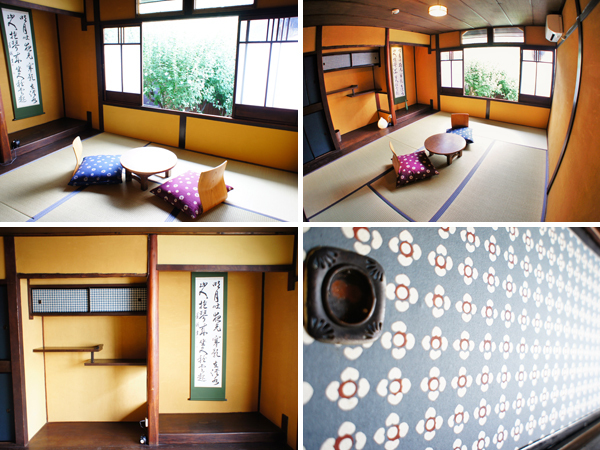 Special room features include fusuma (Japanese sliding screens) with Ichimatsu (traditional Japanese patterns) designs. This room is faces the street and least expensive private room. 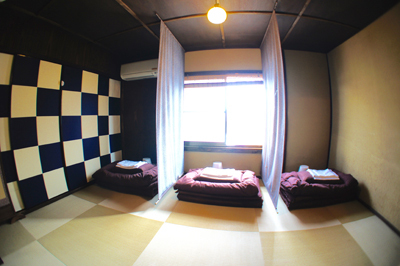 Japanese-style room located on the first floor with a futon bed and tatami mats. This is the largest room in our guesthouse, and special features include Yukimi-shoji (paper sliding doors), and a private garden allowing guests to enjoy the beautiful Japanese landscape through all the seasons. Japanese-style room located on the second floor with a futon bed and tatami mats. 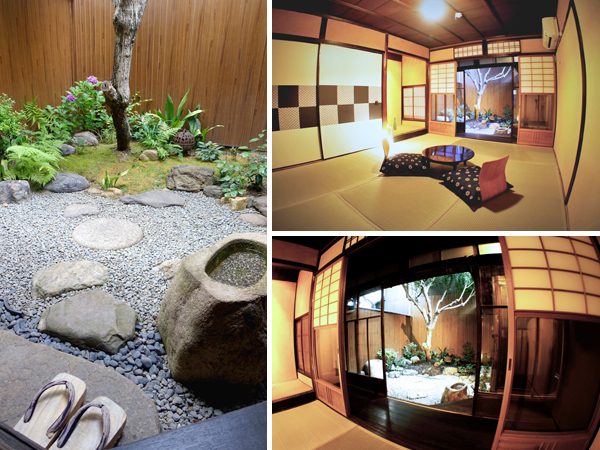 Windows allow guests to enjoy views of the inner garden, creating a unique Japanese atmosphere. 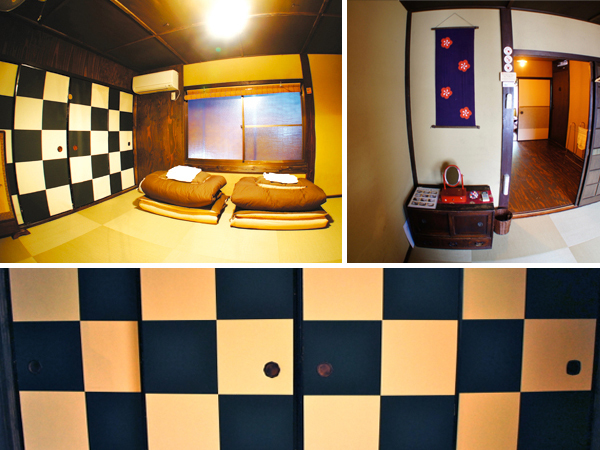 Japanese-style room located on the second floor with a futon bed and tatami mats. Special features include Shippo (Traditional Japanese patterns) wall designs. This room is faces the street. Specially-designed bunk beds includes a futon on tatami base, an electrical outlet, reading lamp and mirror. A curtain provides privacy and a shelf provides space for personal items. Large windows allow guests to wake up to warm, healthy sunlight each morning. ■A simple lock is available for private rooms. while there is no lock for the dormitory rooms. ■ Air conditioner in all rooms. 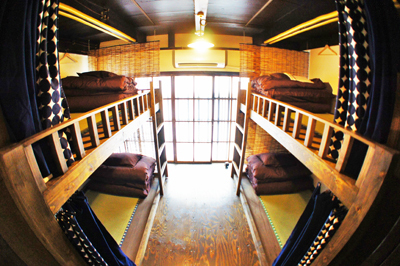 ■Dormitory rooms available age is 12 years of age or older. ■There are many delicate glass doors, paper doors, steep steps, etc., facilities are unsuitable for small children. ■Please refrain from the admission of non-guest to the guesthouse. 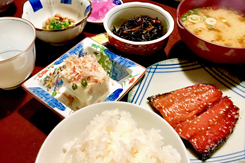 ■ In our traditional Japanese living room, you can enjoy home made breakfast made with gas rice cooker at 8:00 am. Breakfast is 700 yen per person. If a seat of 8:00 am become full, there is a case to ask for the time change. You can choose including breakfast or not when you make your reservation. 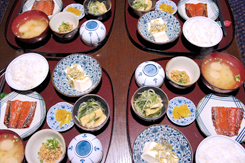 (for example↓) *Breakfast menu is almost the same every day. Copyright © 2019 Kyoto Guesthouse KIOTO All Rights Reserved.